The girls were going to visit Justine and Tony’s offices for the day, so we all set off for the City again together. The bus took forever this time and we were all getting quite anxious by the time we got there as we had a pre booked tour of the Opera House starting at 11.30. We delivered the girls to Tony and made it, but there was not too much time to spare! 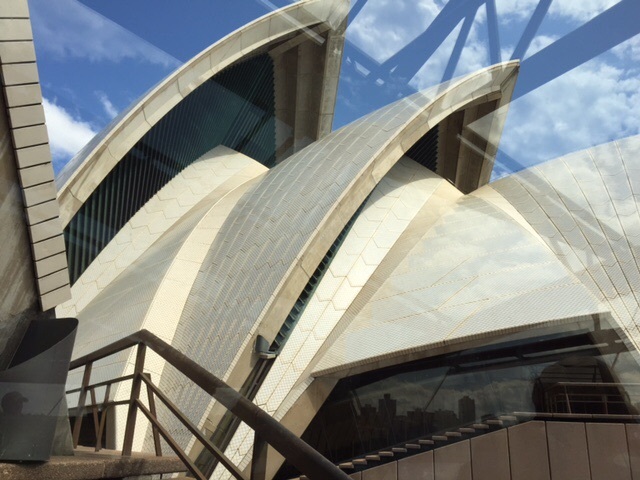 The Opera House is considered to be a sculpture as well as a building it was built by a chap from Denmark called Jorn Utzon, but his relationship with the building had a somewhat chequered history. His father was a naval architect and ithe building was built incorporating ship design features. 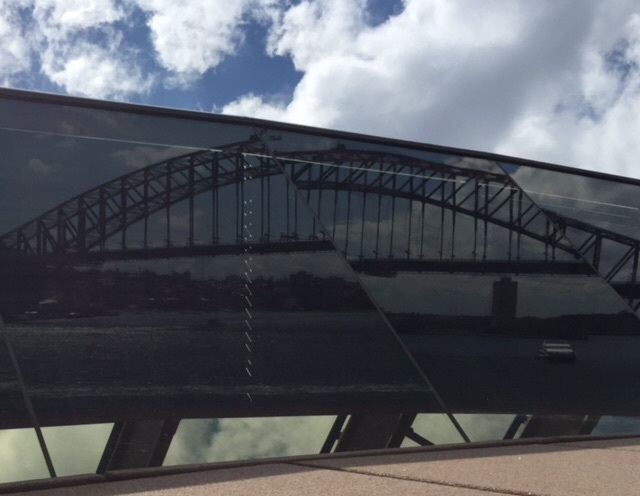 For instance the windows facing out over the harbour have a slope of 45 degrees so there is no reflection – the same technique as that used on a ship’s bridge. The building was also built to last – most modern buildings have a built in obsolescence – i.e. Are destined to exist only for a few years and then be replaced. The Opera House was built to last at least 250 years. 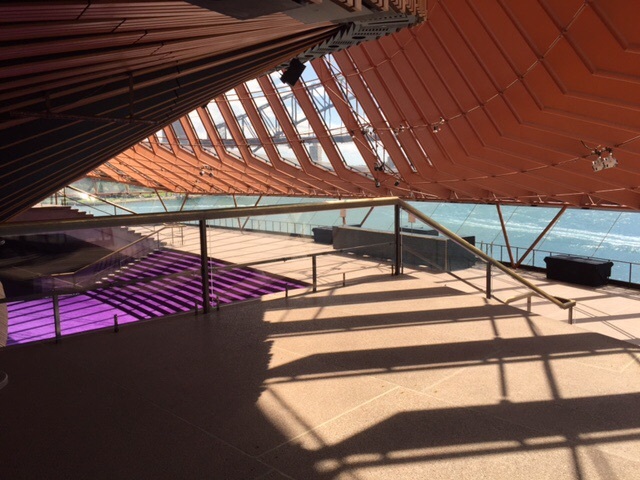 It was originally anticipated the Opera House would take 3 years to build and cost $7 million. 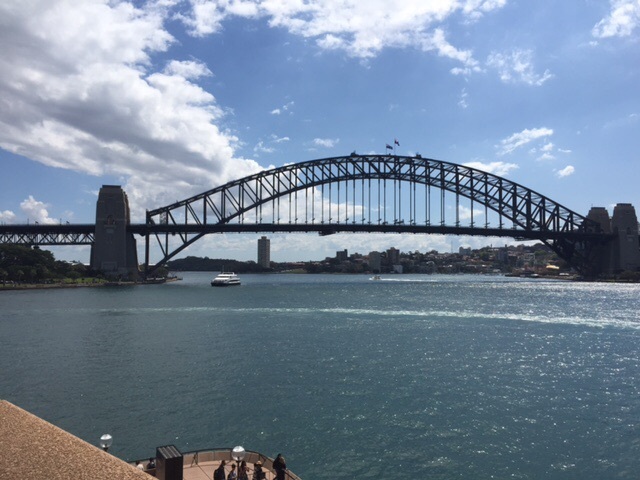 In the event it was commissioned in the 60’s and eventually opened in 1973 and cost $102 million, but Jorn Utzon never saw the building completed. He resigned from the job before it was finished due to political pressures over the costs and never came back to Australia. The money for the building was eventually raised by public subscription and the Lottery Fund. Three years after it was opened Jorn Utzon was re contracted to revisit some areas that had not been built to his original plans. He worked on this project from Denmark, sending his son to Australia to see the task completed. Jorn Utzon died in 2007 by which time the Opera House had been pronounced a Unesco World Heritage Site. Up close, that amazing roof is not the white it appears from a distance, but is made up of 1,200,0006 self cleaning tiles In a sort of cream/ ivory colour. The huge opera house complex incorporates different sized theatres, restaurants and the two large areas for opera and orchestra. The large Joan Sutherland Hall was built for the performance of operas and ballet. The opera and ballet season finished at the end of August and the set for Cole Porter’s musical Anything Goes Was on stage when we went into the auditorium. No microphones are needed for any of the productions as the all wood build provides perfect acoustics and no other means of amplification is required. In the 2,600 seat concert hall, where the Sydney Symphony orchestra was practising when we visited, the enormous organ has over 10,000 pipes and took 10 years to build. It sits imposingly fair and square along the whole back wall of the stage. Both halls are enormously attractive with their modern wood interior and bright red cushioned seats – just oozing a good musical experience. The tour finished and we were just wondering what to do next when the five minute bell went for the Matinee Performance of Anything Goes On the spur of the moment we dashed to the box office to see if there were any tickets left. Miraculously, they had two wonderful seats not taken and with seconds to spare we were back in the Joan Sutherland Hall for an afternoon of familiar tunes, corny repartee, colourful twenties gowns and tap dancing. I could not think of a better way to spend a cool and cloudy afternoon in Sydney. A great decision! The show finished at 4.00 and we were out into a far more dismal day than we had left and we were starving. However we were meeting up with the family for a last supper with the girls, so we had a light snack on the hoof, a glass of wine and a coffee and it was time to meet up with the family Wightman. Given the weather, plans to take the ferry to Manly were abandoned and we all went home on the bus and had a very good Indian Takeaway in from the friendly Jaz at his restaurant in the parade of shops at the end of the road on the Collaroy Plateau. The girls then packed their bags as they were off to see Grandma and Grandpa Wightman in Wellington for a couple of weeks and were flying to Adelaide the early the next morning and we are to be gone before they return. We reluctantly said our fond farewells ( they were to leave the house at 6.00! In the morning ) and promising to return we adjourned to bed. It has been fun spending time with them.